Looking to take the next step in your career? Are you passionate about service? Well, your Elks family may have just the opportunity you’re looking for. The ENF Elks Scholar Fellow is charged with planning, marketing, and leading the Elks Scholar Service Trips – the Elks National Foundation’s newest initiative that allows Elks scholars ages 18 and older to participate in an immersive service experience for one week at a time in various locations across the country. The Elks Scholar Fellow will lead three Elks Scholar Service Trips per year. 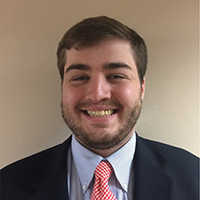 John Kavula started his term as the Elks Scholar Fellow in June 2018. His 2014 Legacy Award was sponsored by the Parma, Ohio Lodge No. 1938 and he is originally from Alabama. He studied Applied Mathematical Economics in the Honors Program at Marquette University in Wisconsin. While studying at Marquette, he was a tutor through the Marquette University Educational Opportunity Program and an Economic Development Intern at the Waukesha County Center for Growth. Most recently, he was a tutor and on staff with Neu Life Community Development working with high school students in an after-school program. He also served on a Marquette Action Program Service Trip on the Pine Ridge Indian Reservation in Oglala, South Dakota. "I am excited to continue to serve communities and support the mission of the Elks on a large scale all while starting a brand new chapter in my life," John shared.